Ok, let's try this in a thread instead of a new post each time someone passes. 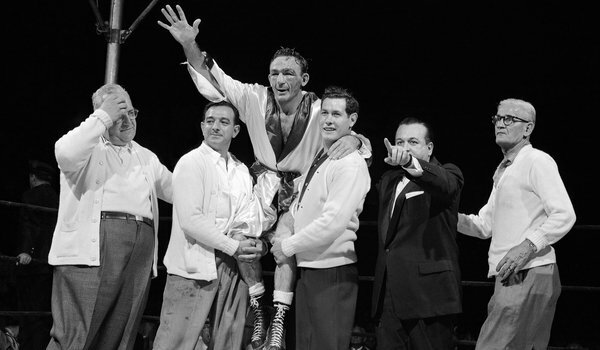 Carmen Basilio, the welterweight and middleweight boxing champion of the 1950s who fought two brutal bouts with Sugar Ray Robinson, winning his middleweight title and then losing it to him, died on Wednesday in Rochester. Basilio, who lived in Irondequoit, a suburb of Rochester, was 85. His death was announced by the International Boxing Hall of Fame in Canastota, N.Y., where Basilio was born. He was among its first class of inductees in 1990. They called him the Upstate Onion Farmer — his Italian immigrant father worked the onion fields near Syracuse — but from the time he was a youngster, Basilio wanted nothing more than to be a pro boxer. He became a champion with an unrelenting style of attack, willing to take punishment as well as dish it out. “There was no one with more determination than Carmen,” his trainer Angelo Dundee, one of boxing’s most renowned cornermen, was once quoted by The Boston Globe as saying. In September 1957, Basilio, who held the welterweight championship, stepped up a weight class when he challenged Robinson for his middleweight title before a crowd of 38,000 at Yankee Stadium. Basilio had resented Robinson ever since their brief encounter four years earlier in Midtown Manhattan. Basilio won the middleweight title in a split decision over Robinson, who, pound for pound, was widely considered the best boxer in history. Robinson almost floored Basilio with a left hook near the end of the 13th round, and he delivered a right hand to the body near the close of the 14th round that left Basilio reeling. But Basilio, displaying his customary grit, pressed forward in the 15th round, punching away steadily. Basilio’s craggy face was a mess when he met with reporters in the locker room. He had a heavy gauze bandage protecting a cut along the outer edge of his left eyebrow, and his eyes were slits from large welts on his cheek bones. He was rubbing a chunk of ice in a towel across his bruised lips. “I figured my aggressiveness gave me the edge,” he said. Basilio was required to give up his welterweight title when he won the middleweight crown, but he was awarded the Hickok Belt as the top professional athlete of 1957. He lost the middleweight title to Robinson at Chicago Stadium in March 1958 in another split decision after fighting with his left eye virtually closed from the seventh round on, a victim of Robinson’s right hook. Basilio rallied with left hooks to the body in the 9th and 10th rounds, but it was not enough to keep Robinson from winning the middleweight championship for a fifth time. Carmen Basilio was born on April 2, 1927, in Canastota, about 25 miles east of Syracuse, and was one of 10 children. His father was “a fight nut,” he recalled, who bought his sons boxing gloves. Basilio boxed in the Marine Corps during World War II, then made his pro debut in 1948. His first title fight came in 1953, when he scored a second-round knockdown of the welterweight champion Kid Gavilan but lost a 15-round decision. He won the welterweight championship in June 1955 with a 12th-round knockout of Tony DeMarco, then stopped DeMarco again in Round 12 of a rematch. He lost the crown on a decision to Johnny Saxton in March 1956, then regained it and defended it against Saxton, knocking him out each time. After his second match with Robinson, he fought only occasionally and made three unsuccessful bids to win a middleweight title again, losing twice on knockouts to Gene Fullmer and on a decision to Paul Pender in 1961, his last fight. He had a career record of 56 wins (27 by knockout), 16 losses and 7 draws. The International Boxing Hall of Fame was built in part as a tribute to Basilio and his nephew Billy Backus, who held the welterweight title in the early 1970s. The Hall contains bronze busts of Basilio and of Backus, who is not an inductee. After retiring from boxing, Basilio, a high-school dropout, taught physical education at Le Moyne College in Syracuse. He also worked in public relations for the Genesee Brewing Company. Basilio’s wife, Josie, traced his decline in health to heart bypass surgery in 1992, The Associated Press reported. A magnetic resonance imaging scan revealed no brain damage from his prizefighting days, she said. In May 2009, Canastota High School, where Basilio was once a member of the boxing team, presented him with a diploma in recognition of his achievements. Basilio is survived by his wife, four children and many grandchildren and great-grandchildren, The Rochester Democrat and Chronicle said. Basilio said he had no regrets, despite all the tattooing his face and body took. The journey to college football royalty began with a cross-country commute in a pickup truck driven by a one-armed stranger. Darrell Royal, 15, packed all his worldly goods in a box that once held a Victrola record player and paid $10 -- a significant sum during the Great Depression -- to return to his hometown of Hollis, Okla., and escape an existence built around performing odds jobs to make ends meet with his displaced family in California. Back in Hollis, the teenager had a place to stay with his grandmother. In the box, he had a letter from the football coach, Dean Wild, confirming a job at a Ford dealership that paid $5 per week and offered Royal the opportunity to rejoin the high school team. Royal said the letter was all the encouragement he needed to try to reshape his life around football. From those humble beginnings, Royal went on to become an iconic football coach at the University of Texas, winning three national championships after an All-America playing career at Oklahoma. Royal, 88, died Wednesday in Austin but left behind legions of admirers from both sides of the Red River and across the country. At the height of his coaching career, Royal ranked "right up there with the Alamo" in terms of Texas icons, said Dan Jenkins, a renowned author and sportswriter from Fort Worth who serves as the official historian of the National Football Foundation's College Football Hall of Fame. Jenkins, a TCU graduate, covered Royal's teams for both the Fort Worth Press and Sports Illustrated. He watched Royal fashion a 167-47-5 record in 20 seasons with the Longhorns (1957-76), claiming national championships in 1963, 1969 and 1970. "If you did a Mount Rushmore with the faces of college football people from Texas, Darrell would be on there," Jenkins said. "[SMU's] Doak Walker would be one. [TCU's] Sam Baugh would be one. The fourth person, you could take your choice. But those three are inarguable." Royal's popularity was not limited simply to those who rooted for the Longhorns, said former Baylor coach Grant Teaff, because Royal never lost touch with lessons learned during his Depression-era childhood. "He never big-dogged anyone like people with his status could have done," said Teaff, now the executive director of the American Football Coaches Association. "He's always been one of the finest men in the coaching profession. The totality of what he accomplished at Texas will rank up there in the top 10 of all-time coaches. And that's a big mouthful when you can say that." Texas Gov. Rick Perry, a former yell leader at Texas A&M, called Royal "the face of football in the Lone Star State for a generation of Texans. ...I join Texans everywhere in mourning his loss." Known as much for his down-home values and clever quotes as the triple-option wishbone offense that triggered a 30-game winning streak (1968-70), Royal had been battling Alzheimer's disease and recently fell at an assisted living center where he was receiving care. In 23 seasons as a college coach, including stops at Mississippi State and Washington that preceded his tenure at Texas, Royal never posted a losing record. His Texas teams won 11 Southwest Conference titles, 10 Cotton Bowl championships and undisputed national titles in 1963 and 1969. The Longhorns also won UPI's version of the 1970 title, with the AP version going to Nebraska. The year before Royal arrived, the Longhorns posted a 1-9 mark in 1956. "Back in those days, he made all the difference in the world in Texas being a top team and just one of many," said Fort Worth oilman W.A. "Tex" Moncrief, a longtime Texas booster and former regent. Royal's shadow will hover over Saturday's game in Austin between No. 17 Texas (7-2, 4-2 in Big 12) and Iowa State (5-4, 2-4), to be played at the stadium renamed in Royal's honor in 1996. Texas coach Mack Brown said the Longhorns will run their first play from Royal's signature wishbone formation, with players also wearing "DKR" decals on their helmets. A public memorial service is set for Tuesday at the Erwin Center in Austin. Royal, who also served as Texas' athletic director from 1962-79, was instrumental in helping Brown land the Texas job after the 1997 season. Brown said Wednesday that Royal's passing meant he lost "a wonderful friend, a mentor, a confidant and my hero." Throughout his coaching tenure, Brown has stressed that Royal's legacy always will be the defining one at Texas even though Brown's record -- 148-41, with a 2005 national championship -- would be considered the gold standard at many schools. "College football lost maybe its best ever and the world lost a great man," Brown said in a statement. "I can hardly put in words how much coach Royal means to me.... Coach gave so much more to the state of Texas and college football than he took away. He forgot more football than most of us will ever know, including me. His impact on ...the millions of lives he touched is insurmountable." The list includes country music artist Larry Gatlin, who credited Royal with convincing him to enter an alcohol and drug rehabilitation clinic -- and then escorting him there -- in 1984. Years later, Gatlin said: "I believe I would be dead if not for Darrell." The quick-witted Royal coined many famous phrases during his career. Explaining why he relied on a ground-oriented offense rather than an aerial attack, Royal quipped: "Three things can happen when you pass and two of 'em are bad." Later in his career, he explained that he would not abandon a run-oriented attack because you've got to "Dance with the one who brung ya." Royal is survived by his wife, Edith, and a son, Mack. The couple had two other children, daughter Marian, who died in 1973, and son David, who died in 1982. COOPERSTOWN, N.Y. -- Baseball's Hall of Fame says former American League president Lee MacPhail has died at 95. MacPhail died Thursday night at his home in Delray Beach, Fla. He had been the oldest Hall of Famer. MacPhail was part of one of baseball's most famous families. He followed his father into the Hall and his son became a top executive for several major league teams. MacPhail was the son of Larry MacPhail, who was president of the Brooklyn Dodgers, CEO and general manager of the Brooklyn Dodgers and co-owner, president and GM of the New York Yankees. Lee MacPhail was GM and president of the Baltimore Orioles and general manager of the Yankees before serving as AL president from 1974 through the 1983 season. Joe “Bud” Sutton, a Philly native who recorded 13 interceptions in just three seasons with the Eagles and one of the oldest surviving Eagles, died Monday. He was 88. Sutton was born in Philadelphia on April 24, 1924, and attended Northeast Catholic High School, leading the Falcons to the city championship in 1942. After graduating, Sutton served in the Army in the 131st battalion in World War II. Upon returning, he attended Temple University. Sutton began his NFL career in 1949 with the Bills, but he really made his mark on the league in his first season with the Eagles, recording eight interceptions in 1950, the most of any undrafted player in the NFL that year. Sutton ranked sixth in the NFL with eight interceptions in 1950, and that remains the sixth-highest single-season interception total in Eagles history, surpassed only by Bill Bradley (11 in 1971 and nine in 1972), Bibbles Bawel (nine in 1955), Don Burroughs (nine in 1960) and Asante Samuel (nine in 2009). Sutton added two more INTs in 1951 and three in 1952. He also played offensive halfback at times, and averaged 7.0 yards on nine career carries,12.6 yards on five receptions and averaged 9.1 yards on 39 punt returns, 20.6 yards on five kick returns. In the first quarter of Bills-49ers game on Oct. 16, 1949, at Kezar Stadium in downtown San Francisco, Sutton scored his only career touchdown, a 21-yard catch from Bills quarterback George Ratterman. Sutton is survived by his wife, Patricia, and their three children; son, Jack and daughters, Cheryl and Nancy. Gail Harris, a 1B for the New York Giants (1955-57) and Detroit Tigers (1958-60) died on November 14th at age 81. Harris' best season was in 1958, when he played in 134 games for Detroit, clubbing 20 HRs and driving in 83 while hitting .273. MLB union leader Marvin Miller passed away. It is sad that he was never inducted to the HOF while he was alive.